D: Does not total or complete surrender require that one should not have left even the desire for liberation or God? Bhagavan: Complete surrender does require that you have no desire of your own. You must be satisfied with whatever God gives you and that means having no desires of one's own. D: Now that I am satisfied on that point, I want to know what the steps are by which I could achieve surrender. Bhagavan: There are two ways. One is looking into the source of 'I' and merging into that source. The other is the feeling 'I am helpless by myself; God alone is all powerful and except by throwing myself completely on him, there is no other means of safety for me.' By this method one gradually develops the conviction that God alone exists and that the ego does not count. Both methods lead to the same goal. Complete surrender is another name for jnana or liberation. Sri Ramana occasionally encouraged his devotees to give him all their problems. That is to say, to tell him about them, and then forget about them. One of his persistent images or metaphors was of a passenger on a train who insists on carrying his luggage on his own head instead of putting it on the floor and relaxing. The idea behind this is that God is running the world and looking after all its activities and problems. If we take some of these problems on our own heads, we just inflict unnecessary suffering on ourselves. 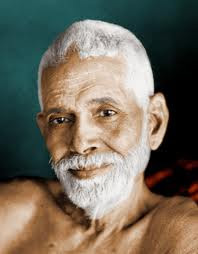 Sri Ramana is telling us that God is driving the train that constitutes our life on this earth. We can sit down and relax with the knowledge that he is taking us to our destination, and not interfere, or we can imagine that we are responsible for it all. We can pace up and down the aisles of the train with 100lbs on our head if we want to. It's our choice. My devotees have the qualifications to rejoice abundantly, like children of an emperor. Abandon the drama [of the world] and seek the Self within. Remaining within, I will protect you, [ensuring] that no harm befalls you. If you inquire and know me, the indweller, in that state there will be no reason for you to worry about the world. For the cruel disease of burning samsara to end, the correct regimen is to entrust all your burdens on me. In order that your needless anxieties cease, make sure that all your burdens are placed on me through the brave act of depending totally on grace. If you completely surrender all your responsibilities to me, I will accept them as mine and manage them. Long ago you offered your body, possessions and soul to me, making them mine, so why do you still regard these things as 'I' and 'mine' and associate yourself with them? Seek my grace within the Heart. I will drive away your darkness and show you the light. This is my responsibility. When people surrendered completely to him, he was more than happy to manage their lives for them. Just about everyone discovered that when she surrendered the burden of responsibility for her life to Sri Ramana, problems diminished or went away completely. Moreover, for those who are residing at Arunachala, it is indispensable in every way. Arunachala is the sacred place where even the embodiments of God, Brahma, Vishnu and Sakti, humbly subsided. Since it has the power to humble even those who would not be humbled, those who do not humbly subside at Arunachala will surely not attain that redeeming virtue anywhere else. The Supreme Lord, who is the highest of the high, shines unrivalled and unsurpassed only because he remains the humblest of the humble. When the divine virtue of humility is necessary even for the Supreme Lord, who is totally independent, is it necessary to emphasize that it is absolutely indispensable for sadhus who do not have such independence? Therefore, just as in their inner life, in their outer life also sadhus should possess complete and perfect humility. It is not that humility is necessary only for devotees of the Lord; even for the Lord it is the characteristic virtue. All this may sound very eccentric unless one understands that humility equates with egolessness, rather than with a kind of 'nice' or socially acceptable behavior. God is God because he is utterly egoless, utterly humble, and not because He is omnipotent or omniscient.